"Roman’s Bride’ proves to be a solid debut from Michael and Anne Paul...Michael Paul directs with confidence and tons of visual flare...Anne Paul, wows with a crazy-good showing as Lily." 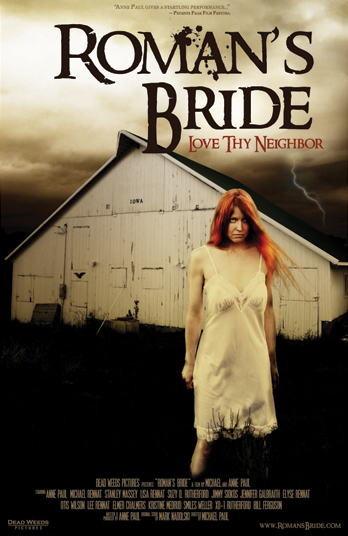 "(Roman's Bride) paints a disturbing picture located at the intersection of religious morality, sexual tension and rural isolation." "Anne Paul, who also wrote the screenplay, gives a startling performance as Lily, combining fragility and cruelty in her portrayl of a badly-damaged psyche." "...let's just say, loony religious fundamentalists and the violence which results, are in no way confined to the Middle East and Islam. ...Iowa (in this case) can provide just as satisfactory a breeding ground..."
"Anne Paul is memorable and disturbing for all the right reasons. ...an incident with a garden hose still has me shuddering." "Anne Paul...envelopes herself into the character of Lily. Her mannerisms, facial expressions, and voice inflections all portray a woman deeply damaged, dangerously conflicted, and heartbreakingly isolated from reality." "It's rare to see originality at this level. This has a feel unlike anything I've seen recently and I like that." Comes complete with Mini Movie Poster Inside!